Does your partner come across as demanding and controlling? Do they seem to keep close tabs on you and question you constantly? No matter how much reassurance you offer, they just don’t seem to settle down and believe that you love them and you’re not leaving the relationship. Your partner might be struggling with early attachment trauma that has caused them to be anxiously attached in your relationship. When someone has a difficult time feeling secure in a healthy relationship, they are likely dealing with early relationship trauma that happened in their childhood with one or more primary caregivers. When someone has a history of being neglected, abandoned (emotionally or physically), or abused in childhood, they will likely have a difficult time trusting that their current relationship is secure, even though the relationship is healthy. Being in a relationship with someone that is anxiously attached is difficult and can feel frustrating at times. It might seem like your partner is never satisfied no matter what you do. It seems like the very thing your partner is trying to avoid by being so clingy is the very thing they are creating with the incessant insecurity. Below is a list of 6 tips for coping with a partner’s relationship anxiety. Part of what stems the anxiety is the fear that you are leaving. If your partner calls or texts and you can’t talk at the time, send a quick response letting them know you got the message and you will respond later. This sends the message to your partner that you are still there even if you can’t talk at the time. Because a person that is insecurely attached can have insatiable needs for reassurance, it is important for your emotional well-being and the health of the relationship to establish healthy boundaries. It would not be healthy for you or the relationship for your partner to call you 10 times a day to make sure everything is still ok. Being anxiously attached is exhausting on the individual that struggles with the anxiety and on the relationship itself. 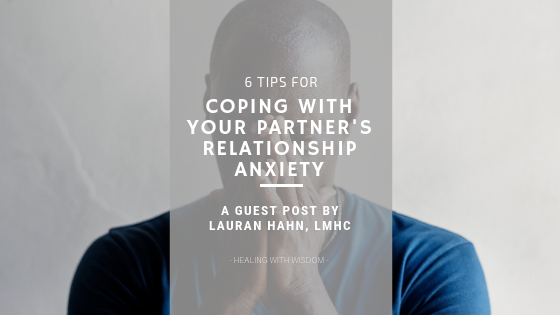 Having compassion for your partner’s anxiety creates a softening toward the pain they are experiencing. This kindness also establishes a sense of safety in the relationship. Have compassion for yourself as you navigate the murky waters of being there for your partner while honoring your own needs in the relationship. It’s easy to take your partner’s anxiety personally. You might think, “I am not good enough” or “I am not doing enough.” Don’t take your partner’s anxiety personally. The anxiety your partner is experiencing is a response to wounds from their past. The support of a couple’s counselor can help you and your partner understand and meet each other’s needs within the relationship. Counseling offers a safe and healing environment to explore what the relationship needs so that both people can feel safe and secure in the relationship. Your partner may want to consider seeing a trauma therapist if abuse or neglect continue to impact them. For more on how early attachment impacts your romantic relationship, check out this post Baffled by your Relationship Patterns? Allow Me to Shed Some Light. Lauran is an anxiety and trauma therapist providing counseling in Orlando, FL. She also specializes in helping people heal old broken relationship patterns that keep them from finding, creating, and keeping healthy relationships with partners, friends, and family. Lauran uses a down to earth approach infused with cutting-edge therapies that go beyond traditional talking to help clients feel calm in their body and mind and find peace within themselves. For more information, visit www.mindfullivingcounselingservices.com. I feel like “don’t take it personally” is one of the most important elements of your post. Others are acting from their perceptions and unique perspectives. It’s not about “you;” it’s about them. Yay! Love this post!